Snap a photo of yourself and share on Instagram why you’d love to attend our annual Made in Maui County Festival in Maui, Hawaii. 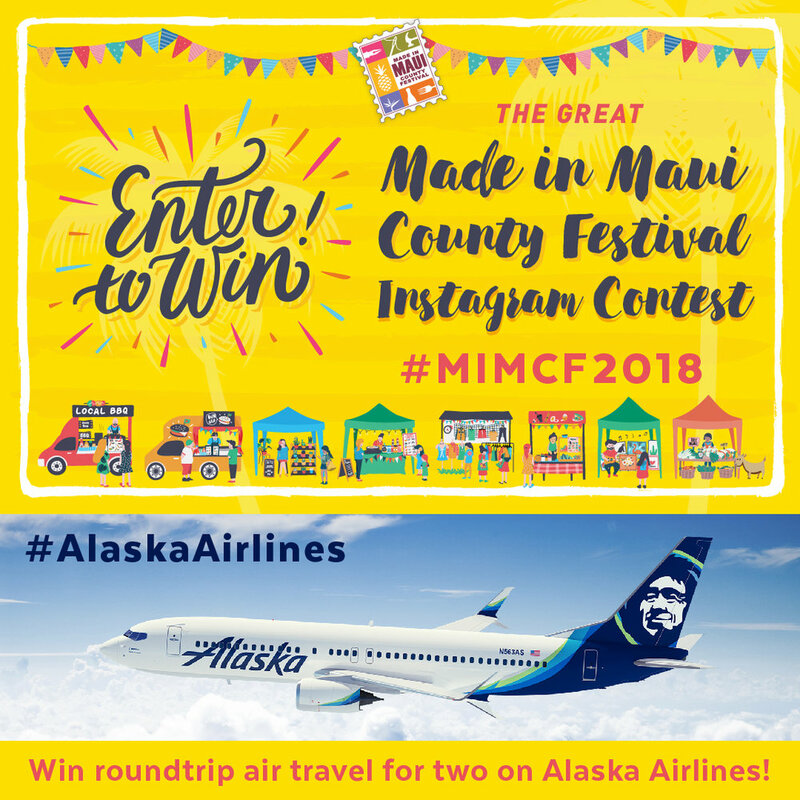 Include the hashtags #MIMCF2018 and #AlaskaAirlines for a chance to win roundtrip air travel for two on Alaska Airlines, plus festival tickets! Snap a photo of yourself and share via Instagram why you’d like to attend our islands’ biggest shopping day of the year – the annual Made in Maui County Festival. Use the hashtags #MIMCF2018 and #AlaskaAirlines in your post so we can find your entry. Make sure to follow @MadeInMauiCountyFestival Instagram, as we will be announcing the winner on November 1, 2018. Contest begins October 1, 2018 and ends 11:59 pm (HST) on October 28, 2018. Winner will receive roundtrip air travel for two on Alaska Airlines, PLUS four (4) Made in Maui County Festival “Exclusive Shopping Day” tickets in November. Air travel can also be used separate from the festival dates, some restrictions apply. Entries will be judged on the most fun photo and engaging message. Contest is open to people 18+ years. Made in Maui County Festival’s “Exclusive Shopping Day” is scheduled on the first Friday of November. Held at the Maui Arts & Cultural Center in Kahului, Maui; festivities include an incredible shopping experience with over 140 vendors from the islands of Maui, Molokai and Lanai; plus the Opening Ceremony, food trucks and drawing prizes. For more information, click here.